Eating too much of the wrong foods is bad for your digestion; and whatÃ¢ÂÂs worse, it shows up in your face as wrinkles, blemishes, bags and more. 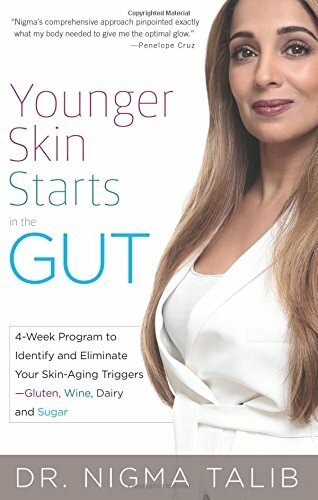 Luckily, by identifying and eliminating your skin-aging triggers, you can simultaneously heal your gut, stop this process of ÃÂdigest-agingÃ¢ÂÂ and reverse its negative effects on your skin. Younger Skin Starts in the Gut provides a complete healthy skin regimen that produces beautiful glowing skin by balancing hormones, preventing inflammation and maintaining well-adjusted digestion. The bookÃ¢ÂÂs comprehensive four-week program and healthy recipes provide solutions to eight different signs of agingÃÂincluding uneven skin tone, puffiness, dark circles and adult acneÃÂand guarantees one blissful result: younger-looking, healthier skin.